I’m here to make your life simpler, Archer. So many different makes and models out there… compared to choosing a crossbow for instance, the task of finding the best recurve bow for the money, preferably one with fiberglass limbs if possible, for you or a loved one, is quite difficult. You’d probably like nothing more than to get it over with so that you can just enjoy the thrill that comes with shooting the ancient, traditional, and high-performance weapon that a great recurve most certainly is. You want to do some research before making a purchase, and that’s where I’m going to help you. I’ve compiled an extensive, interactive comparison chart, which will make it extremely easy for you to find the best recurve bow for your particular needs, regardless of whether you are looking to hunt, target shoot, or even to someday become a member of the World Archery Federation. By the time you are done reading this guide, you will know exactly what to buy. Our Review 3.4 lbs. 40, 45, 50, 55 lbs. 62"
Our Review 2.1 lbs. 50, 55, 60 lbs. 58"
Our Review 3.4 lbs. 30, 40, 45, 50, 55 lbs. Our Review 2.6 lbs. 29 to 55 lbs. 60"
Our Review 3.2 lbs. 45, 50, 55 lbs. 60"
Our Review 3.1 lbs. 35, 40, 45, 50 lbs 60"
Our Review 2.9 lbs. 40, 45, 50, 55 lbs. 62"
2.2 lbs. 40, 45 50, 55 lbs. 62"
Our Review 3 lbs. 45, 50, 60 lbs. 60"
Our Review 2.2 lbs. 20 /  25 / 30 lbs. 62"
Name: this is the name of the bow in question. Length: this is the total length of the bow, in inches, from tip to tip. Bow weight: the weight of the actual bow, in pounds. Draw weight: the “force” required to pull the bow string through a ~28 inch distance. Hand: this tells you whether the specific bow is for an archer who is right-handed, left-handed, or both. Take-down? : this indicates whether the bow is a 3-part, meaning if it can be disassembled into its three primary parts: the riser, the top limb an the bottom limb. Bows that have “Yes” in the 3-parts column will be easier to handle and transport, and you’ll also be able to replace their draw weight in the future by purchasing different limbs. Before you continue: I receive a lot of questions from beginner archers who are unsure of which bow to buy from the list above. While I can’t answer that for you, I strongly recommend going through our reviews and particularly checking out our beginners step by step buying guide; only once you know what your needs are you’ll be able to make a choice. For some people, choosing a recurve (and learning about it) can be too much work. If you find that is the case for you, you may be interested in crossbows instead; they can be just as fun as a recurve, while having a much gentler learning curve – in that case, head over to BCS for a large number of quality crossbow reviews and to HuntingOptics.net for related accessories and optics useful for every hunter; these are much easier to get started with than a recurve, although quite a bit more expensive, on average. You may also check out the crossbow rankings over at ArcheryChoice (see here), though keep in mind their rankings are more appropriate for the budget minded person – they have a very cool comparison grid which will show you at a glance the difference between their top 5 picks, including arrow/nock requirements. As promised, I’m listing the best of the best from my comparison chart. Mind you, everything above is of the absolute highest quality and you won’t go wrong with any of them. However, I’m going to go the extra mile and give special attention to a few bows that me and my colleagues found to be particularly worthy of mention, and which popularity-wise rival even the best compound bow on the market. The Jaguar is currently the most popular bow among archers on a budget (and one of the best martin bows in general), who have never shot a traditional bow before but would like to give it a go while spending as little money as possible. See our Martin Jaguar review for details. This take-down bow is great for both target practice and hunting. It has an exceptionally comfortable grip, and the aluminum riser is very light and durable. It has an elegant yet simple design with no unnecessary parts, so it’s very unlikely that anything will break or require servicing. Being a 3-part means that it’s very easy to transport as well as store, which again is a plus for rank beginners who haven’t yet had the chance to shoot a bow. It will allow beginners to learn the basic construction of their equipment as they assemble it, and will also make owning the bow less of a commitment (as you can simply remove the limbs from the riser and stash it under your bed or in a closet for as long as you like). For more affordable models, check out our best cheap recurve bows ranking page. Very durable – never worry about it breaking down in the field. Very cheap for the quality offered. Suitable for both beginner and advanced archers thanks to the wide range of draw weights available. Take-down construction – very easy to transport anywhere you want, and easy to upgrade when needed without having to buy a new bow. Ask around the archery circles, and you’ll hear nothing but good things about this traditional bow. 64″ length and up to 55 pound draw weight make for an excellent game hunting piece of equipment, as well as one for target practice. Keep in mind though that 64 inches is quite a lot, so it’s much better to use this bow for hunting in open terrain; you’ll probably want to avoid having to shoot it from a tree stand or blind as you might have some maneuverability issues, depending on your setup. See our Martin Saber review for details. The riser on the Martin Saber is equipped with Vibration Vortex V.E.M., which are two little dampening devices that significantly reduce any vibrations an noise that the bow might generate during use. In addition, the handle has an integrated Protective V grip, which reduces vibrations even further and makes the bow very comfortable to draw and shoot. As far as vibration and noise go, the Saber is comparable to much more expensive models. 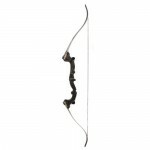 There’s also another reason why the Martin Saber is the best bow in this price range – excellent limbs. They don’t splinter, break or bend even with heavy use. Treat them right, and they’ll last you a lifetime. 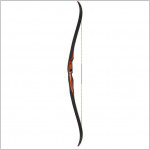 Easily the best recurve bow in this price range. I’ve been using the Grizzly myself for a long time, and I like it so much that I consider all of my other recurves to be “backups” only nowadays. With a maximum 60 lbs. draw weight and 58 inches length, I find its versatility amazing – you can use it to do anything you want – indoor and outdoor target practice, open-field and forest hunting, 3D shooting, you name it. See our Bear Grizzly Review for detailed information. The Bear Grizzly features a look that is worthy of Ferrari designers. The entire bow is coated with satin gloss, making it particularly immune to abrasions and humidity, which is extremely important when hunting. The shelf is cushioned with bear hair providing superb arrow stability. The riser and the limbs are made from Northern Hardwood and high-strength fiberglass, which I have found over the years to be the most durable of material combinations, and one that works really well with a very wide range of strings. By the way; the Grizzly comes with Dacron Flemish, meaning you probably won’t need to replace the string for a very long time. I’ll finish this little review by mentioning that the Bear Grizzly has been on the market, almost unchanged, for over 60 years, and has been successfully used to hunt down lions, bears, and everything “below.” If this isn’t enough testimony to its quality, I don’t know what is. Phenomenal durability and resistance to weather. Sturdy – draw and shoot with complete confidence and without generating any vibrations or noise. Comes with one of the best strings money can buy. At around the current price I would say it’s a steal. This is what you buy if you have some money to spare, and if you are looking for something unique. Personally I do not own it yet, but I’ve had the privilege of shooting it a few times with a friend of mine. Make sure to read our Super Kodiak Review for a detailed rundown of this bow’s performance. 60 inches and a maximum of 60 lbs. draw weight. Basically any arrow you shoot just flies like, well, a true arrow. Really can’t say any more than that, you just need to give it a try and you’re likely to get addicted. Bear-hair covered shelf, real leather side plates, FastFlight string (the tips of the limbs were reinforced for maximum compatibility with this type of string), hardwood construction, satin finish. This definitely isn’t the buy if money is tight at the moment. In all other cases though, just close your eyes and go for it, assuming you can handle the draw weight of course (check the table below to verify whether this is the case). Just plain awesome in every single aspect, I find it perfect from start to finish. It’s so well-balanced and stable that it’s easy to forget you are actually holding a bow in your hands. It’s really hard to miss with this one, an every single shot feels so natural the bow could almost be an extension of your arm. Good for everything that involves shooting an arrow. All kinds of target practice, all kinds of hunting. You can put down a grizzly bear or cape buffalo with this from a good 40+ yards if you have enough draw weight, and I’m not kidding. This one’s a beauty, isn’t she? For some reason, every time I look at it, I think of wood Elves from Tolkien’s stories. However, looks and design aren’t the main reason we voted the PSE Blackhawk the best recurve in the this price range, though. The devil is in the details, so make sure to read our detailed PSE Blackhawk review. Being a one-piece, you could expect durability to be lacking for a product that costs so little. The Blackhawk proves us wrong though – it’s just as durable as other, twice-as-expensive bows. Laminated hardwood was used to create the riser, which comes with a close-to-the-hand shelf, making it a perfect choice for instinctive shooting practice – which, after all, is one of the main reasons we love our recurves so much. 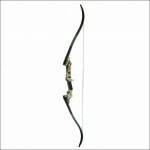 This bow comes in a variety of draw weights, ranging from 35 to 50 pounds in 5 pound increments. I must say, the 45 pound version is an absolutely amazing piece of equipment for hunters. 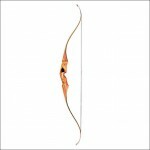 It’s so strong and durable, and you can actually feel the transfer of energy from the string to the arrow take place. It’s the greatest feeling really, way better than gun recoil. And if you’re wondering about the penetrative potential of the Blackhawk at full draw, suffice it to say that you can easily pick off a deer and even elk from 30+ yards away, assuming of course your aim is on point (and that your bow has enough draw weight). The design on this one is very simply too, meaning that chances of anything going wrong are limited; this is particularly important for beginner archers, who should strive to keep things as simple and “uncomplicated” as possible to avoid unnecessary servicing and repairs – at least until they get comfortable around their stick and string. Exceptional durability and stability for a one-piece in this price range. Available with many different draw weights. The 45 lbs. and 50 lbs. versions are serious pieces of equipment in the hands of a focused hunter. It just looks right and feels right when you hold it – the calling of the wild? A wonderful bow, looks almost like a piece of jewelry, doesn’t it? 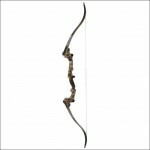 The PSE Razorback is available in 20, 25 and 30 lbs. Draw Weight versions, all of which will be suitable for women and youth – the smaller your frame, the lower the draw weight of your choice should be. Excellent for target practice both indoors and outdoors. Available for both left- and right-handed Archers. The Take-down construction makes it very easy to transport and store, and the laminated wood limbs more than guarantee durability. Please make sure to read our PSE Razorback review for tons of details. This bow is a very accurate one and hits really hard despite the low Draw Weight. And what about the handle? Maple, Oak and Walnut. Elegant, beautiful, and timeless. You won’t regret the purchase, I promise. In fact, I know a man who liked it so much that he purchased two of these – one for his wife and one for his daughter. 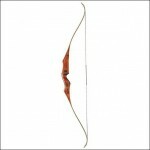 Important Note: the PSE Razorback is a relatively long recurve, standing at 62″ in total length. Therefore it might not be the best choice for teens who are really short (below 5 feet). If that is the case, you’re better off choosing another, shorter bow, and with 35 or less pounds of draw weight. It generally shouldn’t be an issue, and it’s not at all unusual for archers to successfully shoot bows that are taller than they themselves are. Every single one has been researched to death, and I’ve personally used or know people who have used each of them, as well as dozens of other bows. Each of those bows is well capable of performing at 30 yards and more.I did my best to pick 2-3 of the best bows that every respectable company in the archery business has to offer. I included the best bows in each price range. All of these bows include high quality bowstrings. Many people forget just how important the string is to the integrity of the bow, an the fact is that unless the string fits the rest of the construction well, you’ll experience trouble such as unnecessary vibration, noise, inferior arrow flight, and more. 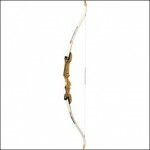 I therefore made sure that each bow listed here had a high quality, suitable string already included with the package. They all are safe to use. Each of us has different preferences when it comes to traditional bows, I’m fully aware of that. However, I have tried to diversify my list above as much as possible to make sure that almost everyone can find the best bow for him or herself. What Draw Weight Is Right For You? Your purchase will depend on how advanced you are, how you are going to use your new bow, and a few other factors. For instance, if you are not very strong and/or don’t have too much experience with recurves, then you may want to go with one of the bows that have smaller drawing weight versions available; otherwise, and particularly if you plan to practice a lot at the range, you’ll find your arms and lateral back muscles will get tired very quickly. In that case I would recommend going with a bow that has a draw weight of 40 pounds or less. 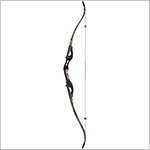 On the other hand, if you already have some experience in the field of archery, have good muscle strength/endurance, and /or plan to use your bow only for hunting game, you will want to go with a model that features a draw weight of 45 pounds or more. You can use the following chart as a simple guideline for determining what drawing weight range you should be aiming for. Keep in min that this is general advice, though it will absolutely help you make your purchase. Try to go for the lower end of each draw weight range simply because archery is supposed to be a fun and relaxing activity – if you are cringing every time you pull the string and while holding your stance, then the draw weight is too much. This is particularly true if you are using the pinch draw, also known as the “primary draw’. More on that here. You now have all the information you need to make an educated purchase, and to acquire a recurve that is a perfect match for you. You could basically buy any of the bows I’ve discussed above at random, and you’re more than likely to be very pleased – as long as you make sure the draw weight matches your body build, as shown in the chart above. Have you ever tried a couple of different black widows? I haven’t unfortunately, however I’ve heard from people that they are solid and that – most important for a company that makes a lot of custom bows – they have excellent customer service. I might have used one a few times but definitely not enough to form an opinion. Hope the above helps though – I think they are worth a try. Hey there, thanks for that info very informative! I have never even drawn a bow, but want to get into the sport. Do you recommend saving and buying one of your higher priced bows and sticking with that? 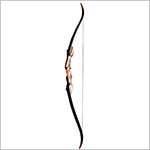 Or buying an entry level bow, get my mechanics down and then upgrade? I would say this only depends on your budget. If you’d rather spend less then definitely go for something cheaper first and then either sell it and get a higher quality bow, or just buy a new one and you’ll have two 🙂 If money isn’t an issue though, going for something better like the Bear Grizzly will make your first encounter with traditional archery far more satisfying and rewarding. Both options will work great, especially if you stick with the recurves I mention on this site, as they are all high quality. It’s all up to your budget. I have had the chance to shoot a Bear Supermag 48, a Martin Hunter and a Blackwidow PA ΙΙ Graybark.All of them shoot well but the attention to detail, the beauty of the Blackwidow surpasses them by a long shot. it is well worth the price. Look into Fedora bows. Mike Fedora has been making bows for over 40 years. His advertised prices state at $450 but go up with the exotic laminations and riser woods. I have two, went to a lower weight 6 years ago. “As we get heavier (older) our bows get lighter”. Thanks for your website. It is very informative and was a pleasure to dig in. It really helped me a lot. However one question would actally really be of interest for me. Your main hunting preference seems to be the bear grizzly recourve. What is your personal preference point compared to the Super Kodiak, the Martin Hunter and the Hoyt Buffalo (exept that it is a Takedown). Sorry made a mistake. Mentioned bear grizzly recourve, however meant bear super kodiak. I actually prefer the Hoyt Buffalo the most for hunting. I’m not sure I understand your question, could you elaborate please? I have a boy turning 13 and he has gone through a compound, an inexpensive recurve and is now interested in something with a heavier weight. He only does target practice and competes at camp. What is the next step for a boy asking for lessons and is serious about the art? first on a liberal budget and second with no budget at all, but both with exceptional bang for the buck and exceptional quality. Is your boy’s name by any chance Ben? Because I was contacted with the exact same situation you just described by a very determined 13 year old boy 🙂 I already recommended the Martin Saber or Martin Jaguar — let me know if I’m correct in my assumption. Thanks! Thanks for your reply. Actual I use a Samick Squall 45# my first bow for about two years now and think about an upgrade? Even if I am most shooting on targets and make 3D, I like to get a good and fast, silent hunting capable bow. Therfore I’m surfing around to prepare a more focused trial with a dealer in my environment. Many threats are really positive about Bear and Martin, which lead me to the Martin Hunter and the Bear Super Kodiak (50#). After reading and digging within your very helpful page I added the Hoyt Buffalo to my shortlist, concerned if I can find all three for a try. Your review is really great for all three. In the moment I’m a tick more in favour for the Martin (may be price and history respect). Nevertheless even it is at the end a personal preference flavour, I’d appreciate your personal view/ vote and reason, ignoring the Hoyt takedown argument for the moment. To get your expierienced personal point, might be a additional hint/help. thank you for the hard work you put in – After reading loads of reviews & articles on your site I finally bought a beautiful Bear Grizzly based on your recommendation. I’m in love with it! Well worth waiting a few weeks of saving up for. Now here’s the thing… my 8 year old son & 10 year old daughter want to upgrade from their little fiberglass bows to wooden recurves. Thank you for the kind words, and really happy to hear about the Grizzly! Can you tell me what your budget is for the kids, and whether this budget is for just one bow, or two (one for your son and one for your daughter)? I love this site! It has been so helpful in my decision making process for a good recurve bow. It’s so hard to find good info on recurves especially since I cannot find them stocked in any stores, and I am new to archery. I have a question of you if would be willing to help me out. As far as grip size goes, I think the Blackhawk should fit your hand nicely (it’s comfortable for most people with small hands that I’ve seen shoot it). Then again, grip comfort is purely a matter of personal preference, so it’s really difficult to make an assessment over the internet and without actually holding the bow. Overall though, I think the Blackhawk is a relatively safe bet for you, with very low risks. Also keep in mind that the better your bow holding form and technique is, the more comfortable you will feel holding a wider range of bows. So what might feel a little uncomfortable at first, can become much more comfortable as your technique improves. Hope this helps! Hello, thanks for this very informative site. I want to buy a Martin Hunter, my draw length is 27′ and I will buy a 55lb draw. My question is what type of arrow should I buy, I am always confused in arrow shaft size and lenght..should the lenght be 27? Currently I have a 62′ samick with 50′ draw and my arrow size is easton’s 2117, 28 in lenght with 120 field points..would that be a current arrow for my specs? Please give it a read and let me know if you have any more questions. I have a 31 inch draw length. What length recurve bow would you recommend to avoid stacking? Do you have any specific suggestions? Generally speaking, most good recurve bows should not have serious stacking issues up to the 31″ draw mark. However if you want to be extra safe, make sure to get a bow with a minimum length of 2x your draw length. So if your draw length is 31″, get a 62″ recurve or longer to reduce stacking to an absolute minimum. thank you for a fast reply, sorry mine has taken longer (we’ve been offline, camping). re: wooden bows for my 8yr old son & 10 yr old daughter – budget could be a few hundred each for Christmas. Both kids are strong, train in Kung fu. Daughter is 5’7″ already. Hey, nice to know this website! well, i have a rather unusual question, how much muscle do i need to shoot at 50-55lbs? i have a decent accuracy and experience at field targeting (considerable groups at 50 yds. on open sights) but i never shot an arrow before, but i have always been drawn in it. I have no muscle, i’m quite a “nerdy” guy, but i have precision and the ability to target quickly! so, do i need to work out desperately before becoming a Legolas? hope i’m not hopeless. The amount of muscle someone has is definitely not an indicator of strength; I’ve seen skinny people easily handle 60 lbs. bows, whereas guys with what you would consider to be large muscles had troubles handling 50 lbs. With that said, I’d still recommend going for a bow with less draw weight and working your way from there. You should probably get a take-down recurve bow so you can change the limbs a few months down the line and increase the draw weight. It would be awesome if you could get your hands on a recurve bow first and give it a try to see what you are capable of; if this is not an option, I’d recommend starting out with a 35 lbs. bow; you’ll probably work your way up to 50-55 lbs. quite quickly. As far as exercises go, anything you can do to strengthen your lateral back muscles will work great. So pull-ups, bent over barbell/dumbbell rows, etc. Arm strength is almost irrelevant – it’s all about the back muscles. 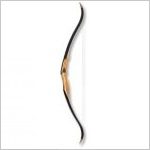 I just bought a imp mountain man recurve at 62″ 40# I have a draw length of 32 inches. After reading some of your info I’m worried this might put too much stress on the now. Is this true? Ideally your bow would be 2x your draw length or more (so 64″ and up). However the difference isn’t huge. If your bow was 58″ or 60″, I would worry. To be completely honest though, I do not have enough experience with this as neither me nor any of the archers I know have a draw length of more than 30″, so you should take my advice on this one with a grain of salt. In my opinion however, 62″ should not be a problem, especially on a bow as resilient as the. I’m sorry I couldn’t give you a more definitive answer. I am a beginner, looking to get my first bow for target shooting. 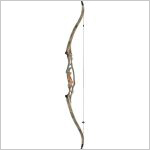 The research I have done suggests that for my draw length of 27.5″ I should be using a bow no less than 66″AMO, other sites have suggested that I could use a bow between 62 – 64 ” I do not want to be over bowed to start off, nor do I want to buy a bow that is proper for a beginner. What would you suggest? Obviously the longer the bow the better as far as accuracy goes. However so far as comfort goes, you’ll do fine with a bow as short as 58″. 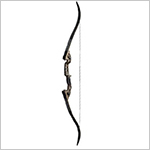 There are tons of bows in the 58″-62″ range so you should choose one from those. Thanks for the advice I really appreciate it. Is it advisable to install sights on a recurve? From the rentals I’ve used at the range I’ve found myself to be incredibly inaccurate and can’t manage to have reliable grouping. Will a sight help with this? Also, how do you determine your draw length? I want to pick the right bow, but I have to get my specs first. Thanks, all of the information here has been very helpful. BTW, I mainly intend to target shoot with the recurve I purchase. I have decided to try archery as a personal hobby. You have a lot of great information here for beginners. I will most likely be doing solely target practice, but would like to have a Bow with enough Draw Weight to give me other options in the future. I was wondering if the “best pick” lists you have here are updated for 2015? And I was curious if you know enough to form an opinon on the Martin Take-Down Wood series…I’m looking at the Willow and the Cypress? I understand that the longer the Bow, the more accurate it is, but is there a cut off length depending on the indivuduals height? As far as Draw Weight, I’m still not 100% clear what I should be going with. According to your chart, I should use 40-55, but how can I be sure that I have the ability to draw that kind of weight? Im guessing the only sure way is to go to a local archery place and try some different weights? Thank you in advance for any help. hi there, i loved the gamemaster 2 review and it made me want to buy one. i have 31″ drawlenght. will the 62″ of the gm2 be good for me or will there be stacking? i was planning to start with 40# limbs. how much drawweight will i actually have at my 31″ with these? There will be minor stacking for sure due to your long draw, however if will get used to it pretty quickly. Just take your time and don’t rush things, get used to the hold. EXCELLENT WEBSITE ! Just what the archery doctor ordered.. It will really help in my next purchase. Thanks for the kind words Jon, best of luck. You have a very informative website. Now I was just wondering if you would have any suggestions for a recurve with these particular priorities? Threaded for a plunger arrow rest. Take down for easy transport. A shorter bow preferred 48 inch with a draw weight of 45 pounds do to my short height and being used in a tree stand. Thank you in advance for any help you might bestow on me. Do you have a review for the SAS Courage Bow? I have a recurve (non-takedown) bow. 64″ 28# and have model or brand name of Valiant. Who made it? I had a quick question about the Bearpaw Kiowa. Have you ever had a chance to test one? I was curious to get your thoughts. For some reason I am not seeing the column that shows whether a bow is right or left handed. What do you recommend for a beginner takedown model that comes in leftie and is fiberglass(since those tend to come already pre-drilled for accessories. I draw 30-40# with 30″ draw length. Thanks! Have you tried Cartel Epic Hawk Recurve Bow Package and how does it compare to Samick Sage? I am a beginner as yet and need something reasonable in price and quality. Hi, thanks for all the awesome info. My girlfriend is 27, but she’s 90lbs and pretty weak, her draw length is 28″ and she’s left eye dominant. But right handed so she holds the bow with her left hand. We just tried archery for the first time and she’s pretty sore and I think they had 10 or 15 pound bows at the range. Do you know what would be a good bow for her? We’re on a pretty tight budget. Thanks! I would probably get myself a 30lb bow just in case she needed to upgrade in the future. i have a PSE stalker and the lower riser snapped into pieces how do i get a new one ? love it but it snapped while restringing it to use. I have gotten back into the sport after many years. I am shotting a Samick Sage #40. I am using a 24 inch riser for an overall bow length of 67 inches. I draw to 31 inches. I like the Sage but have been wondering if I should think of upgrading. I am strictly a weekend shooter, not in competition or hunting. I shoot just for fun. What size arrows wud I need for a 40lbs recurve bow ?